India grappled with an injury worry to in-form Yuvraj Singh ahead of the fourth cricket one-dayer against a demoralised England here tomorrow but have enough ammunition to take a series-clinching 4-0 lead in the seven-match series. Yuvraj, who hit a match-winning century in the previous tie in Margao, missed the practice session as he underwent an MRI scan for a swelling in the leg at a local hospital. Imran Farhat and Younis Khan hit half-centuries as Pakistan thrashed Sri Lanka by eight wickets in the second and final Test here today to clinch the series 1-0. Railways denied Uttar Pradesh a domestic title double when they beat the newly crowned Ranji Trophy champions by 20 runs with 2.5 overs to spare to clinch the national inter-zonal knock-out one-day final here today. The Indian Weightlifting Federation seems to be lost for an explanation for the latest dope scandal to hit it resulting in a second ban in less than two years. It is a second coming for Jugraj Singh (23). Like the proverbial phoenix he too has risen from the ashes to make a gallant comeback to the national hockey squad. It was a red letter day for the heroes of the recent Melbourne Commonwealth Games who hogged all the limelight at the Prime Minister Manmohan Singh’s residence followed by another grand ceremony by the Indian Olympic Association here today. The Jung clan was present in full force as Samaresh received the David Dicksen Trophy from Indian Olympic Association president Suresh Kalmadi at a felicitation function at the Ashoka Hotel here today. A string of impressive performances has catapulted Gagan Narang to the top of the world rankings in the men’s 10m air rifle category in the latest list announced by the International Shooting Sport Federation. Brian Lara to make a comeback. India grappled with an injury worry to in-form Yuvraj Singh ahead of the fourth cricket one-dayer against a demoralised England here tomorrow but have enough ammunition to take a series-clinching 4-0 lead in the seven-match series. Yuvraj, who hit a match-winning century in the previous tie in Margao, missed the practice session as he underwent an MRI scan for a swelling in the leg at a local hospital. Captain Rahul Dravid, however, said the Punjab left-hander would be fit and available for selection for the crucial tie that leaves the visitors with no option but to win to keep themselves afloat in the series. Though the injury scare to Yuvraj will no doubt be a worrying factor for the hosts, the form of opener Virender Sehwag will also give the team management a sleepless night. Sehwag has been given a fresh lease of life to prove himself and it remains to be seen whether the Delhi marauder changes his batting style to rediscover his form which has eluded him for long. It will also be interesting to see whether Sehwag is dropped down the order, an option that the Indians may try out to help the opener to be among the runs again. Robin Uthappa, who replaced Gautam Gambhir in the team, may get to play his first one-day international and the Karnataka opener will be keen to grab the opportunity with both hands. Coach Greg Chappell said in no uncertain terms the other day that Sehwag, as well as Mohammad Kaif who had four ducks in five innings after the Goa match, would be given a long rope but their chances to regain form would not be endless. “Both Kaif and Sehwag are very experienced. Both have the skills to succeed and would be given as many chances. But obviously it can’t be an endless one,” he said after the comprehensive 49-run victory in the third ODI. Uthappa has come into the team by virtue of his impressive show in the Challenger Series in October last year. But six months is a long time in international cricket and whether the 20-year-old from Bangalore can reproduce the form remains to be seen. 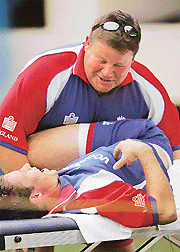 On the other hand, England will be dearly hoping that they halt the losing streak and prevent a whitewash. They should thank Pakistan for beating Sri Lanka in their one-day series that has spared the Englishmen of having to qualify for the ICC Champions Trophy later this year in India. Andrew Flintoff, who has led the side admirably in the absence of skipper Michael Vaughan and other key players, has lacked support from his teammates in the one-dayers. The visitors have not shown the same intensity seen in the Test series and the tour is fast falling apart. The heat and humidity of this city on the Arabian Sea coast would severely test the character of the visitors who have an unenviable task of winning four matches on the trot to win the series. 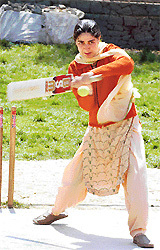 Bowling will be the main concern of the English think tank. Their reluctance to play a second spinner might have cost them dearly in the three matches while the new crop of seamers, Sajid Mahmood and Kabir Ali, have not been impressive enough. The team will entirely depend on Flintoff and Kevin Pietersen to help them put up a huge total and put the pressure on the Indians. The home team went in with five specialist bowlers in the last match and it remains to be seen whether a similar strategy is used tomorrow on a track, which was expected to provide some help to the bowlers. Teams: India: Rahul Dravid (captain), Robin Uthappa, Virender Sehwag, Yuvraj Singh, Mohd Kaif, Suresh Raina, Mahendra Singh Dhoni (wk), Irfan Pathan, Harbhajan Singh, Ramesh Powar, Shantakumaran Sreesanth, Ajit Agarkar, Rudra Pratap Singh, Venugopala Rao, Munaf Patel. Farhat hit 11 fours in his seventh Test half-century while Younis regained form with his 14th half-century after scoring just 43 in the previous three innings against the hosts. It was a painful farewell Test for veteran Sri Lankan opener Sanath Jayasuriya, who was unable to bat in the second innings due to a thumb injury sustained while taking a catch yesterday. The hosts’ hopes of defending a modest target depended on ace off-spinner Muttiah Muralitharan, the only bowler to complete 1,000 wickets in Tests and one-day internationals. Sri Lanka needed a couple of early wickets to put pressure on Pakistan, but managed just one in the morning when makeshift opener Kamran Akmal was superbly caught by a diving wicket-keeper Kumar Sangakkara off seamer Lasith Malinga. Akmal, opening the innings following the withdrawal of Shoaib Malik due to fever, contributed a brisk 26-ball 24. When Farhat was caught by Jayawardene at first slip off seamer Nuwan Kulasekara in the afternoon session Pakistan were just 31 away from victory. Younis kept his end intact and completed the formality with Mohammad Yousuf (14 not out), who finished the match with a brace off Malinga. Younis hit 12 fours in his 98-ball knock. Sri Lanka earlier lasted just one ball before being dismissed for 73, their second-lowest against Pakistan in 32 Test matches after 71 at the same venue in 1994. Seamer Asif finished the match with 11-71, the second-best figures by a Pakistani bowler against Sri Lanka following 14-116 by Imran Khan at Lahore in 1982. Asif was adjudged player of the match and the series. Fall of wickets: 1-22, 2-40, 3-46, 4-56, 5-57, 6-65, 7-72, 8-73, 9-73. Bowling: Asif 12-6-27-5, Anjum 3-1-8-0, Gul 3-0-15-0, Razzaq 6.5-1-20-4. Fall of wickets: 1-38, 2-152. All-rounder Shreyas Khanolkar provided the star turn for Railways in the battle of two central zone outfits by top scoring with 73 to help his team pile up 224. He later took three important wickets for 46 runs with his off breaks, including that of top scorer Ravikant Shukla (44 in 51 balls with five fours), to apply the skids under UP. UP were all out for 204 in 47.1 overs, with their last two batsmen run out in a frenetic chase towards the end which left talented youngster Ali Murtaza stranded on a well-made 33 not out. Murtuza had kept UP firmly in the hunt by putting on 32 runs in 44 balls with Amir Khan (13) for the eighth wicket before Railways fought back to polish off the last three wickets in ten runs in the space of 14 balls. Earlier, Khanolkar came to Railways’ rescue with a timely partnership of 104 ruins for the fifth wicket with Sushant Manjrekar (47) to pull his side from deep trouble after they had plunged to 41 for four in the 12th over. Khanolkar hit five fours in his 92-ball innings before being seventh out at 195. He put on another crucial 41 runs with G Shankar Rao (38) that helped Railways cross the 200-mark. The Indian Weightlifting Federation (IWF) seems to be lost for an explanation for the latest dope scandal to hit it resulting in a second ban in less than two years. IWF President H. J. Dora, also the Chef-de-mission of the Indian contingent to the Melbourne Commonwealth Games, was, on the one hand, basking in the glory of the splendid performance by the athletes, especially the lifters, and, on the other hand, hard pressed to react to various queries on the positive dope test of Edwin Raju and Tejinder Singh. “Despite our best efforts, this scourge refuses to leave us. We thought the worst was behind us last year but it has come back to haunt us,” Dora said. He claimed the two lifters were tested negative before leaving for Melbourne and expressed surprise at the turn of events. Both of them tested positive for stanozole in Melbourne. “I do not understand why these two lifters will take performance enhancing drugs when it does not improve their results in any way,” the WFI president said. Raju finished fourth in the 56 kg category while Tejinder withdrew from the 85 kg competition citing illness. “The same was the case with Pujari Shailaja who would have got a gold medal lifting below her personal best. She did not need to resort to doping,” Dora claimed. He put the case of women lifter B Prameelavalli in the same category. IWF, which had previously claimed that the Asian junior champion did not go to Melbourne due to her personal problems later admitted that traces of banned substances were found in her sample and she pulled out at the last minute. “The lifters had come out clean in WADA dope tests. None of them tested positive and nobody disappeared ahead of the tests. “I had warned them that if they ran away from the tests, that would be the end of their careers. But they assured that they had nothing to hide and willingly underwent the tests,” Dora said. The IWF President also denied that the coaches had a hand in the wrongdoings. “Why would a coach induce one or two lifters to use performance enhancing drugs? After all, it is the same coach for every athlete,” he pointed out. The Commonwealth Games Chef-de-mission also indirectly hinted at possible foul play in the recurring dope saga. “May be, there are certain elements who get jealous at our success at international competitions,” he said. “But we cannot make such claims as we can never substantiate such claims,” Dora said. The Indian masseur, charged with indecent assault at the Commonwealth Games athletes village in Melbourne, refused an out-of-court settlement claiming his innocence, the Indian chef-de-mission for the mega event said today. “We tried for an out-of-court settlement but the masseur Diwan Asghar Nabi refused to consider it as he thought he had done nothing wrong,” H. J. Dora said here. Dora, who is also the president of the Weightlifting Federation of India, said Nabi felt that an out of court settlement would leave a blot on his character forever. “Nabi has been steadfast in claiming his innocence saying he just wanted to take a picture with the girl who has alleged indecent assault,” Dora said. He said if Nabi had agreed to the proposal put forth by the officials of the Indian contingent, they could have approached the girl in that regard. Meanwhile, the girl in question and another female attendant at the Games Village has testified in a Melbourne court sticking to their charges. “We have provided legal counsel to Nabi and have requested for a swift trial as the masseur has a family to support in India,” Dora said. On a gloomy September day in 2003, Jugraj rammed his car into a road divider on the GT road near Ludhiana and this near fatal accident meant that his effervescent career was almost over. His problem was not how badly his body was injured but where he had sustained his injuries. For a drag flicker, the right arm and the right thigh take the maximum pressure during the execution of a penalty corner. And this is where he had suffered the most. At that time, experts had even pointed out that bending for him, which is a standard position for hockey players, would be tough because of the pelvic injuries sustained by him. However, as things now stand, Jugraj has proved beyond reasonable doubt that he is determination personified. Otherwise, it is next to impossible to explain his recovery and that too after a series of operations he underwent in the USA. The charge of the youth brigade was never as forceful as the one the young turks in coach Rajinder Singh’s (senior) squad launched during the national team’s five major outings in 2003, just before Jugraj was injured. For the next 30 months, there was one name missing from the bunch. A player, who under loads of criticism, was just about winning over the doubting Thomases with a passionate performance against Pakistan in the Amstelveen Champions Trophy. Jugraj Singh was the one who put himself on the line when he charged out to stop the red hot drag flicks from Sohail Abbas, a display which won over his critics. Unfortunately, when everything was going off well for the Punjab Police Inspector, came the road accident which made him lay low for almost three years before he finally earned his comeback. Jugraj Singh, whose all time favourite players are Dutchman Brom Lomans and Sohail Abbas, made his debut in the u-18 Asia Cup held in Ipoh in 2001. In the next two years he had virtually conquered the hockey world by giving superb performances in the 2002 Kuala Lumpur Asia Cup and the Champions Trophy in Cologne (2002) and Amstelveen (2003). His moment of glory came when he scored seven goals, six of them penalty corners, in the 2001 Hobart Junior World Cup which India won under the captaincy of Gagan Ajit Singh. A product of the Jalandhar-based Surjit Hockey Academy, Jugraj now is bracing up for the sterner tests ahead. Shooting stars Samaresh Jung and wife Anuja, Gagan Narang, double gold medallist paddler Achanta Sharath Kamal, veteran lifter Kunjarani Devi, pugilist Akhil Kumar and the women’s hockey team basked in the glory of their achievements that had sweat and sacrifice written all over it. They were busy obliging the media telling them about how years of hard work have got them the glory, how they always wanted to win medals for the country, how they were enjoying every bit of the praise showered on them at a city hotel here. The Jungs were the star attractions as both husband and wife gleefully spoke to the media giving a miss to their lunch. “This sort of recognition work wonders for the morale of any sportsperson and this will spur us to win more laurels for the country,” Samaresh said. Sharath Kamal, not habituated to have a spotlight on him, said, “I am really surprised at the kind of reception that I got since returning home. There were some 300 people waiting for me at Chennai airport and people told me that it was something that even the cricketers don't get to see.” “I am overwhelmed and it has given me more responsibility. We have raised the level and now we need to maintain it,” Sharath told PTI. 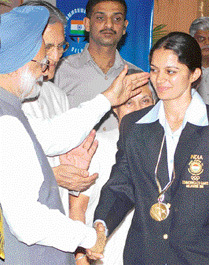 Seasoned paddler Poloumi Ghatak, who won the bronze medal in women’s table tennis team event, described her meeting with Prime Minister Manmohan Singh as “a special moment”. “We have put in so much hard work in last couple of years and it is very satisfying when you do well and people recognise your hard work,” an estatic Poloumi said. “It is a sign that table tennis in India is going in the right direction.” The sportspersons also felt that it was high time that the corporate sector and sponsors take notice of their feats and give the much-needed support necessary for the development of the game. “It is very important for us that badminton gets sponsors so that we can play more international tournaments and get high quality training,” said Chetan Anand, who won the bronze medal in badminton singles at the Games. “We spend our own money to train abroad, though we do get some help from the Federation. But everyone is not in a position to spend from their pocket and there we need help from the corporate houses,” he said. Mamta Kharb, part of the silver medal winning women’s hockey team, said it was their chance to be under the spotlight, which is mostly reserved for their male counterparts. The Jung clan was present in full force as Samaresh received the David Dicksen Trophy from Indian Olympic Association (IOA) president Suresh Kalmadi at a felicitation function at the Ashoka Hotel here today. Samaresh got the trophy for being adjudged the “most outstanding athlete” at Melbourne. The ace shooter could not be present at the closing ceremony of the 18th Commonwealth Games as he had to leave for China to participate in the International Shooting Sport Federation (ISSF) World Cup, and hence could not receive the award. Narang, who became the first Indian shooter to have qualified for the 2008 Beijing Olympics after winning the gold medal at a recent World Cup in China, jumped 18 rungs for his career-best placement in his pet event. The 22-year-old has had several podium finishes in the last few months including four gold medals with record scores in the recent Commonwealth Games at Melbourne. Narang’s earlier best rank was eighth which he achieved last year. Olympic silver medallist Rajyavardhan Singh Rathore maintained his sixth rank in the men’s double trap event. Rathore won a gold and a silver medal at the Melbourne Games.